english name "Imai's Slender Caesar"
intro On this page, each description is duplicated. The first of each pair of descriptions is based on recent collections from Japan by Bas, Yang, and Doi (1999). The second of each pair of desriptions is based on the description of Gilbert (1940) and the original description by Imai (1938). cap Bas, Yang, & Doi: The cap A. longistriata is 30 - 90 mm wide, grayish to grayish buff, sometimes with a slight pinkish tinge, sometimes grayish brown to brownish in the center, hemispherical at first, convex to plano-convex, with or without a small umbo, with a long-striate margin ((20-) 30 - 50% of the radius). The flesh is white. Gilbert & Imai: The cap of A. longistriata is 50 - 100 mm wide, smoky-umbrinous or clove-brown, darker in the center, convex at first, then plane, viscid when moist, smooth, with a long striate margin. Volval remnants are absent. The flesh is thin and white. gills Ba, Yang, & Doi: The gills are free or even remote from the stem, rather distant, up to 11 mm broad, beautifully pale clear pink at first, later paler pink, with a minutely white, uneven, and floccose edge. The short gills are obliquely truncate. Gilbert & Imai: The gills are free, crowded, broad, and white becoming pale pinkish. stem Bas, Yang, & Doi: The stem is 90 - 180 × 5 - 15 mm, close to cylindric or slightly tapering upward, pinkish-white at first, becoming white, with a proportionately broad central cylinder. The ring is in the upper part of the stem or almost at the midpoint, membranous, thin, and whitish. The volval sac is 20 - 30 (-40) × 10 - 20 mm, 0.5 - 1.5 mm thick, membranous, white or whitish on the exterior, with an internal limb placed above the point at which the stem is attached to the volva. Gilbert & Imai: The stem is 100 - 180 × 8 - 15 mm, narrowing upward, white, stuffed at first, then hollow, mostly undecorated, minutely floccose to minutely scaly below the ring, minutely powdery above the ring. The ring is membranous, placed high on the stem, skirt-like, rather broad, and white. 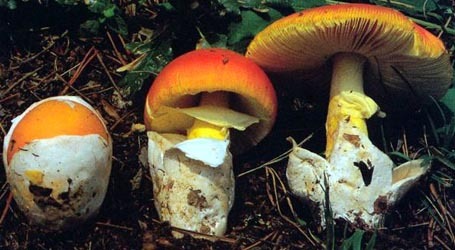 The saccate volva is ample, 20 - 50 × 10 - 35 mm, for the most part free from the stem, connected only at the stem base, rather thick, persistent, proportionately large, and white on the outer surface, palely concolorous to the cap on the inner surface. odor/taste The odor is said to be indistinct. The taste is said to be mild. spores Bas, Yang, & Doi: The spores (8.0-) 9.0 - 12.0 (-13.5) × (7.5-) 8.0 - 10.0 (-11.0) µm and are dominantly broadly ellipsoid, sometimes ellipsoid or subglobose and inamyloid. Clamps are often present at bases of basidia. Gilber & Imai: The spores measure 12.5 - 15 × 10 - 12.5 µm and are broadly ellipsoid and inamyloid. Clamps are almost certainly present at bases of the basidia. Spores measured from the Gilbert's drawings (1941) are: 10.5 - 12.6 × 8.8 - 10.5 µm. discussion This species was originally described from Japan. It has also been reported from South Korea and China. It occurs solitarily or in groups in several forest types, sometimes with fir (Abies). author S. Imai. 1938. J. Fac. Agric. Hokkaido Univ. 43(1): 11. ≡Amanitopsis longistriata (S. Imai) E.-J. Gilbert. 1940. Iconogr. Mycol. (Milan) 27, suppl. (1): 75, tab. 5 (fig. 6). lectotypifications Hongo. 1959. Mem. Fac. Liberal Arts Shiga Univ. 9: 70.
revisions Yang and Doi. 1999. Bull. Natl. Sci. Mus. Tokyo B 25(3): 114-115, fig. 10.
selected illustrations E.-J. Gilbert. 1941. Iconogr. Mycol. (Milan): 27, suppl. : 224, tab. 7. The following material is derived from the protolog of the present taxon, (Yang 1997), and (Yang and Doi 1999). NOTE: Spore measurements from papers by Z. L. Yang use his "Times New Roman" face for "Q" and "Q'"—respectively, "Q" and "Q.
pileus Yang and Doi (1999): 30 - 90 mm wide, slightly grayish buff, sometimes with very slightly pinkish tinge, grayish, sometimes grayish brown to slightly brownish over disc, at first hemispheric, then convex to plano-convex, with or without small umbo, subviscid, glabrous; context white; margin usually long-sulcate (0.3 - 0.5R), occasionally short-striate (0.2 - 0.25R), nonappendiculate; universal veil usually absent. lamellae Yang and Doi (1999): free or even remote, (sub)distant, when very young beautifully pale but clear pink, later paler pink, up to 11 mm broad, with edge minutely flocculose or subdenticulate; lamellulae obliquely truncate. stipe Yang and Doi (1999): 90 - 180 × 5 - 15 mm, at first pinkish white, later white, subcylindric to slightly narrowing upward; context with proportionately broad central cylinder; partial veil superior to almost median, membranous, thin, whitish; universal veil as saccate volva; membranous, white to whitish, 20 - 30 (-40) × 10 - 20 mm, with limb ca. 0.5 - 1.5 mm thick, with limbus internus placed slightly above point of juncture of stipe and limb. odor/taste Yang and Doi (1999): Odor indistinct. Taste mild. subhymenium Yang and Doi (1999): 30 - 40 μm thick; cellular; inflated cells in 2-3 layers, subglobose to ovoid to ellipsoid, 10 - 23 × 8 - 15 μm. basidia Yang and Doi (1999): 34 - 48 × 11 - 13 μm, 4-sterigmate, with sterigmata 3 - 5 μm long; clamps common. universal veil Yang and Doi (1999): On pileus: not seen. On stipe base, exterior surface layer: filamentous hyphae more or less irregularly arranged, 2 - 5 (-7) μm wide, hyaline, thin-walled; inflated cells rare. On stipe base, interior layer: with elements irregularly to somewhat longitudinally arranged; filamentous hyphae dominant, 2 - 7 (-12) μm wide, hyaline, thin-walled, branching, interwoven; inflated cells scarce to scattered to locally fairly abundant, subglobose to ovoid, 50 - 70 × 35 - 50 μm, sometimes ellipsoid to fusiform, 50 - 120 × 20 - 50 μm, colorless, hyaline, thin-walled; vascular hyphae rare; clamps present. On stipe base, inner surface layer: gelatinized, with filamentous hyphae 1 - 3 μm wide. partial veil Yang and Doi (1999): filamentous hyphae, dominant, subradially to irregularly arranged, 2 - 6 μm wide; inflated cells usually rare, locally abundant, clavate to broadly clavate, 20 - 30 ×, colorless, hyaline, thin-walled; vascular hyphae rare; clamps very common. basidiospores type revision of Yang (1997): [100/1/1] (9.5-) 10.0 - 13.0 (-14.0) × (7.5-) 8.0 - 11.0 (-12.0) μm, (Q = (1.03-) 1.11 - 1.35 (-1.56); Q = 1.22 ± 0.08). non-type material, Yang (1997): [80/4/1] (9.5-) 10.0 - 12.5 (-13.5) × (8.0-) 8.5 - 10.0 (-11.0) μm, (Q = (1.08-) 1.11 - 1.31 (-1.44); Q = 1.22 ± 0.06). Yang and Doi (1999): [175/8/5] (8.0-) 9.0 - 12.0 (-13.5) × (7.5-) 8.0 - 10.0 (-11.0) μm, (Q = (1.02-) 1.06 - 1.33 (-1.53); Q = 1.19 ± 0.08), hyaline, colorless, smooth, thin-walled, inamyloid, dominantly broadly ellipsoid, sometimes subglobose or ellipsoid; apiculus small; color in deposit not recorded. ecology Japan: Solitary to gregarious. Japan: In forest of (e.g.) Abies. material examined Yang (1997): JAPAN: HOKKAIDO—? ?, 12.viii.1935 S. Imai s.n. (holotype, SAPA). HONSHU—Yamanashi-ken - Mt. Fuji, Yoshida-guchi, 6.ix.1983 C. Bas 9040 (L). Yang and Doi (1999): JAPAN: HONSHU—Tokyo Metropolis (Pref.) - Oume City, Kurosawa 3-Chôme, along left-side ridge of Kurosawa-gawa R., along hiking course, 16.vii.1997 Y. Doi & K. Miyazaki s.n. (TNS F-182475) s.n. (TNS F-182478), 5.x.1997 Y. Doi s.n. (TNS F-237593); Chiyoda-ku, garden of Fukiage-Gosho Imperial Palace [ca. 35°41'12" N/ 139°45'26" E, 6 m], 12.vii.1995 T. Tobishima s.n. (TNS F-180370). Yamanashi-ken - Mt. Fuji, Yoshida-guchi, 6.ix.1983 C. Bas 9040 (L). discussion Yang and Doi (1999): "The colour of the fruitbody is mainly based on the field notes of C. Bas 9040. ... Amanita longistriata is close to A. incarnatifolia Z. L. Yang (a new name for A. rhodophylla Imazeki & Toki (Yang 1997: 52). It differs from the latter in its somewhat larger basidiocarps, longer striations on the pileus margin, and wider basidiospores (Yang 1997).